Open Source is about freedom. Akira is about giving the freedom to designers who want to use Open Source. I’m a Linux user myself, and I’ve been for years, but I’m the first to admit that the current status of the Linux Desktop, doesn’t allow designers to be productive and competitive in a world dominated by extremely fast, reliable, and modern proprietary applications for MacOS and Windows. 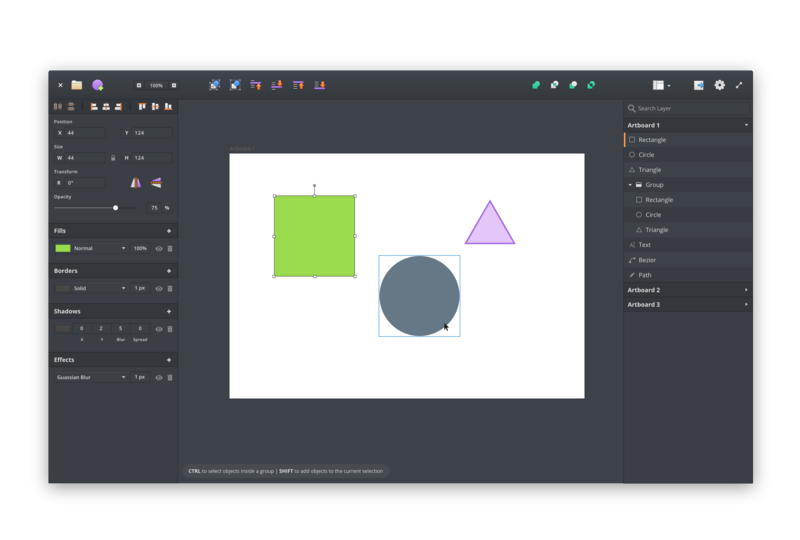 The main purpose of Akira is to offer a fast and intuitive tool to create Web and Mobile interfaces, more like Sketch, Figma, or Adobe XD, with a completely native experience for Linux. How is this different from Inkscape, Glade, or QML Editor? It is drastically different in every aspect, from its purpose, to the different usability approach we're building. 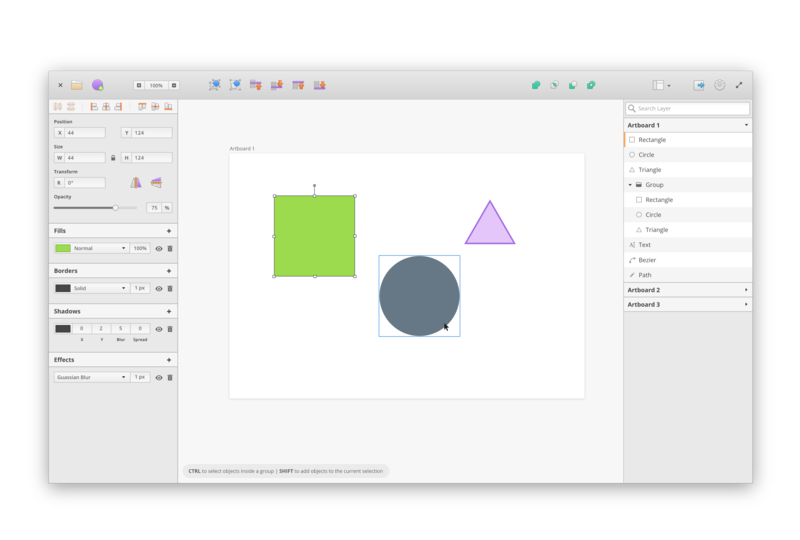 While tools like Glade or Qt Creator are used to generate code and create working user interfaces that use specific toolkits like Gtk or Qt, Akira is a more general tool to design those interfaces before they're implemented - it's used for creating mock-ups, visualizations and vector graphics. Inkscape is a great vector graphics tool, but it's mostly focused on print design and the user interface isn't ideal. Using Figma or Sketch, shows a different overall approach to the creative workflow, those tools are more intuitive and natural to use compared to Inkscape. That's what Akira is striving for. This is a large estimate, I know, and a lot of you will question if it's too much money, or the hardware amount is absurd, or the taxes amount is out of scale. I wrote down these numbers to be as honest and transparent as possible, letting you how I will be using the amount, and I also hired and accountant to be sure I got the numbers right. With that said, if for any reason I end up not using the full amount and I find myself with some extra cash, I will use it to hire the developers for an extra month, or donate to the GNOME foundation, or send extra T-Shirts to everyone who pledge for FREE. I'm not trying to get rich! This is not a scam! I'm not trying to steal your money! All the money I'll get will go into the project. The code base will be entirely written in Vala and GTK+3. The build system will be handled by Meson. All the icons will be custom made respecting the SVG standard. Akira will be available from the elementary OS AppCenter, and as a FlatPak. Daily Builds will be available through the official PPA. We’re open to implement or accept contributions for other distribution formats like Snap or AppImage, but that will depend by the final amount and availability of contributors. Light mode, dark mode, symbolic and non-symbolic icons, with labels or no labels, it doesn’t matter. We will build the Akira Interface in order to be adaptable to your needs and taste. We will work to implement an extendable theme system for every user to customize. This will be a project within the project. In order for Akira to be competitive, it needs to rely on a modular and scalable approach to handle the canvas. Building a new Canvas Library from scratch is the way to go in order to have full control of the outcome, and build something truly modern and innovative. The Canvas itself will be released as a standalone library that anyone can use inside their own project. We want more vector based apps and we want to make your life easier. Every single shape will be handled like a standalone path with 2 levels of editing. The first level (shape edit), activated on select, will allow standard transformation options like rotate, resize, flip, etc. The second level (path edit) will allow to handle the shape like a standalone path, with the ability to move, add, and remove vertices, use bezier curves, and break or close paths. An extremely intuitive Layers panel will be one of the main focus for this first release. You will be able to create Artboards, Layers, and Groups with infinite levels of indentations. You will be able to quickly reorder layers with a drag and drop functionality, lock and hide layers, and rename them for easy convenience. In order to keep things simple, we will implement the default GTK font manager, with future plans of creating something custom that can support and easily tap web fonts as well as system fonts. A new .akira file format will be a ZIP file containing your standard SVG design files and a local .git repository. This will give us the ability to store all your project information like colours, symbols, fonts, etc, and will open up to the possibility of having a built-in version control system within your file. The usual and must have SVG, JPG, PNG, and PDF exports will be supported. No proprietary file format will be supported for export or import for now, but this could change in the future. Building an application like this from scratch is not an easy thing. Having the goal of releasing the first stable version in less than 4 months is a bit of a gamble. We will probably have to make sacrifices in terms of functionalities and extra features, but nonetheless, we will make it happen. Shipping a usable and promising MVP is all we need to showcase the potential of this product and how it can drastically change the Linux Desktop Ecosystem. A donation. Thank you very much! Your support will help Akira become a reality! Your name will be mentioned in the Akira’s credits, making you the coolest person ever. We'll send you a cool postcard with Akira art! You will also get a mention in Akira’s credits. Your name in the credit, Akira postcard, and some kickass stickers. Your name in the credit, Akira postcard, some kickass stickers, and an exclusive t-shirt. All of the perks above, plus an exclusive digital download of dedicated tutorials for Akira, and the ability to vote for which feature should have the priority. That’s a lot! You’ll get access to all the perks listed above, plus you’ll have 1 hr of exclusive video chat with Alex to ask about anything related to Akira. You will get a personal walk-through of the plan, timeline, features, and extra juicy hidden things. You will also have the ability to choose a feature that will immediately be tackled as top priority. You really love Akira! You get everything listed above, but also, you’ll get 1 year access to a protected Cloud VPS directly linked into Akira to automatically back-up your design files and share them with whoever you want.